Card Text Action: Ready and fight with a friendly creature. What happens if Gauntlet of Command’s “Action:” ability is used on a stunned creature? The stunned creature would become exhausted and the stun token would be removed. No fight would take place, and no “Fight:” abilities would resolve. Any attempt to fight with a stunned creature will invoke the normal stun removal rules, even if circumstances wouldn’t normally allow the creature to fight, such as no opposing creatures or a card ability that prevents creatures from being used to fight. When a creature is stunned, the next time the creature is used (e.g. fight, reap, or another action) the only thing that happens is the creature exhausts and the stun token is removed. Whether you attempt to fight, reap, or perform another action, it does not resolve, nor do any abilities associated with that usage resolve (such as “Reap:” or “Fight:” abilities). Therefore, when using Gauntlet of Command’s “Action:” ability on a stunned creature, the creature would become exhausted, the stun token would be removed, and no fight or “Fight:” abilities would resolve, regardless of the active house or circumstances that may prevent the creature from being used to fight normally. Can Gauntlet of Command’s “Action:” ability be used on a creature that is not exhausted? Yes. You always resolve as much of an ability as possible. Therefore, the creature would remain ready and then it would fight. If there are no enemy creatures to fight, the “Action:” ability would not resolve. 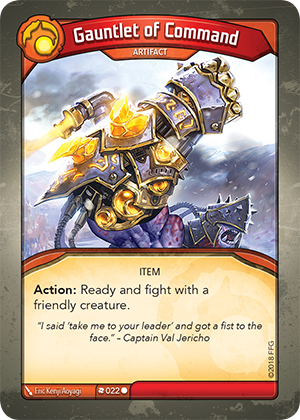 Can Gauntlet of Command’s “Action:” ability be used on a friendly creature from a non-active house? Yes. The only restriction is that the creature you select is “friendly” (i.e. under your control). Therefore, you can choose any friendly creature in play. That creature must fight, if possible. What happens if Gauntlet of Command’s “Action:” ability is used on a creature and there are no opposing creatures to fight? If the opponent has no creatures on their battleline, the creature is readied, but does not fight. Assuming the creature is usable – e.g. via the active house or another ability – you can then choose to use the creature in a different way, such as reap; otherwise, the creature is unable to be used. Example: if there are no enemy creatures in play and you choose Brobnar as your active house, you could reap with a Brobnar creature and then use Gauntlet of Command’s “Action:” ability to ready it. Since there are no enemy creatures to fight, you could choose to use the creature in another way, such as reaping again.